Sales and Supplies of Small, Medium and Larger Sized Taper Threaded Brass Taps, Miniature Barrel Spigots and Wine Spouts for Wooden Barrels, Casks and Wooden Kegs - These European Made barrel spigots, taps and spouts are made from a special, food grade brass alloy and lubricated with alimentary oil making them an ideal fitting to small wine barrels, wooden kegs and larger oak casks and do aesthetically enhance the look of any Wooden Barrel. These tapered taps can cater for any barrel hole from 10 mm to 31 mm and are ideal for wine, port, whiskey, liquor and other distillates dispensing and serving at home, bars, cellars and restaurants. The TBG range of small and medium sized taps and spouts can be fitted into small sized wooden barrels up to 25 liters. The smallest spout would be the TBG01 mini tap that can be fitted into miniature barrels in addition to non wooden containers such as glass jars or bottles. The larger TBG02, TBG03 and TBG04 tapered brass taps are typically fitted into wooden barrels that are up to 10-30 liters in size. The TBG06 can also be fitted to such barrels and comes with a key that helps secure the contents of such wooden barrels if needed. 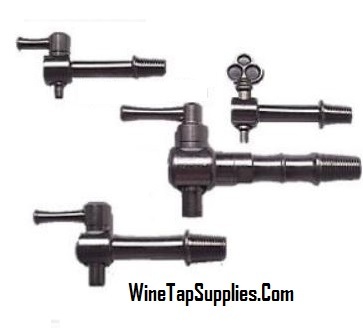 These spigotbrass taps are typically used to dispense wines, port, whiskey and other distillates. The larger TBG05 brass taps and spouts can fit medium, large and very large barrels from 20 liters up to 600 liter casks and vats or larger. Sturdy and long, lasting the TBG05 can bepadlocked and in addition to dispensing wines, port, whiskey and other distillates these brass spigots are also used as an alternative to wooden taps at whiskey distilleries. Note: Padlocks are not supplied with the taps. Metal Barrel Taps & Spouts for Small & Larger Wooden Barrels, Kegs & Casks. The CBT range of metal taps come in various sizes and do make a great dispensing tap for small, medium sized and larger barrels. The BRN089 range of large tapered barrel taps is made from brass and nickel plated. This barrel tap model is available in 4 sizes and can be fitted to medium and large sized casks and is very popular as a rain water barrel spout. 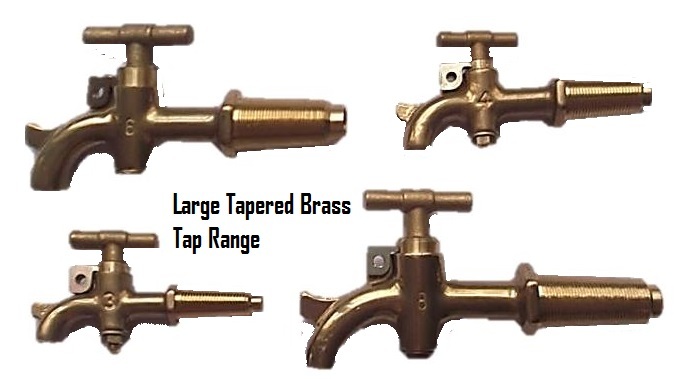 Sample , Trade and Non Trade Orders: Our small, medium sized and larger Taper Threaded Brass taps are usually in stock and can be purchased in single, small or larger quantities and shipped to the US, Canada, Australia, New Zealand, UK, Europe and internationally.